A little bit of cold weather never stopped you from taking the dogs out on a snowshoe expedition around the local lake, and thanks to the Mountain Hardwear Women's Stretchdown Down Jacket, your ambitions to get outside are officially unstoppable. 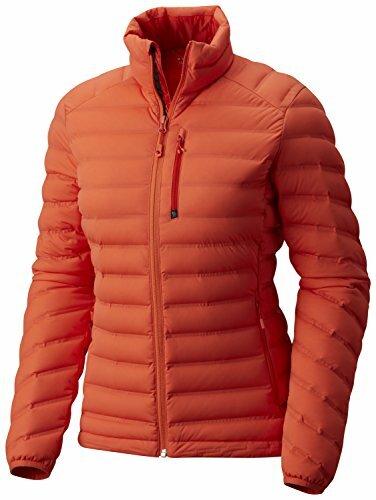 Catering to most, if not all, of your cold weather pursuits, this jacket features a lightweight yet robust stretch-knit fabric that provides weather-resistant protection and unrestricted mobility, and can be worn as a single layer or underneath a waterproof shell in seriously inclement weather. The Q. Shield down insulation is fortified with a water-resistant coating that protects the down from precipitation, which ensures unlimited versatility. And perhaps the most important and discerning feature is the stretch welded channel construction that not only discourages biting winds from penetrating your core warmth, but assures ample temperature regulation and furnace-like fervor even on the coldest winter days. If you have any questions about this product by Mountain Hardwear, contact us by completing and submitting the form below. If you are looking for a specif part number, please include it with your message.